Hydroinformatics is a strongly inter-disciplinary field, which links water and environmental problems with various computational modelling methods and fast developing information and communication technologies. Especially the need to standardize and harmonize data protocols and descriptions has prompted many researchers to seek approaches and solutions to overcome data and communication heterogeneity aimed at increased levels of interoperability between different data systems. Hence, a special focus of this conference will be the assessment of the current state of the development of data management (in the broadest sense) approaches that address important aspects related to data storage, data curation, data interoperability, data registration, data provenance, data stewardship, and data annotations. Finding solutions to these challenging problems requires close collaboration between scientists – established as well as young ones, – informaticists, software developers, practitioners, and stake holders from public and federal organizations. So we encourage you to contribute to the development of future solutions and to widen your own expertise and profile by attending and participating in the conference. HIC-11 is the latest in a well-established series of bi-annual Hydroinformatics conferences started in the early nineties. Furthermore this conference is supported by three world-leading international organisations, IAHR, IAHS and IWA. Zoran Vojinovic, Yared Abebe, Arlex Sanchez, Neiler Medina, Igor Nikolic, Natasa Manojlovic, Christos Makropoulos, Mark Pelling, Michael Abbott, 2014: “Holistic Flood Risk Assessment in Coastal Areas – The PEARL Approach” – Special Session S10-01: Combining Quantitative and Qualitative Data and Methods for Flood Resilience in Urban Areas, on 17/Aug/2014: 3:45pm-5:30pm, in Room 374. 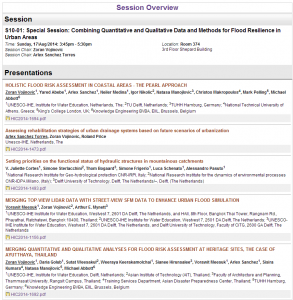 Arlex Sanchez, Zoran Vojinovic, Roland Price, 2014: “Assessing rehabilitation strategies of urban drainage systems based on future scenarios of urbanization” – Special Session S10-01: Combining Quantitative and Qualitative Data and Methods for Flood Resilience in Urban Areas, on 17/Aug/2014: 3:45pm-5:30pm, in Room 374. Zoran Vojinovic, Daria Golub, Sutat Weesakul, Weeraya Keerakamolchai, Sianee Hirunsalee, Vorawit Meesuk, Arlex Sanchez, Sisira Kumara, Natasa Manojlovic, Michael Abbott, 2014: “Merging Quantitative and Qualitative Analyses for Flood Risk Assessment at Heritage Sites, the case of Ayutthaya, Thailand” – Special Session S10-01: Combining Quantitative and Qualitative Data and Methods for Flood Resilience in Urban Areas, on 17/Aug/2014: 3:45pm-5:30pm, in Room 374. Xavier Llort, Rafael Sánchez-Diezma, Álvaro Rodríguez, David Sancho (HYDS), Marc Berenguer, Daniel Sempere-Torres (CRAHI), 2014: “FloodAlert: A Simplified Radar-Based EWS for Urban Flood Warning” – Special Session S1-01: Real-time Monitoring of Urban Water Systems, on 17/Aug/2014: 10:45am-12:30pm, in Room 201. Álvaro Rodríguez, Xavier Llort, David Sancho, Rafael Sánchez-Diezma (HYDS), Ramón Bella, Vicente Gómez (AQUALOGY), 2014: “Hidromet: A Cloud-Based EWS Platform for Real Time Urban Flood Warning” – Session R59: Real-time Control of Flood Events, on 18/Aug/2014: 3:45pm-5:30pm, in Room 201.